lactose fermented hot sauce | eating with S.O.L.E. In a wide mouth mason jar place chopped peppers (as many as you have) along with a couple chopped garlic and 1 onion in the bottom of the jar. Gauge how much water it will take to cover it, and in a separate container mix water with sea salt at a 1 cup – 1 tsp ratio. Pour brine over veggie mix ensuring the veg are fully covered. I found a perfect size glass to sit inside the jar mouth which allowed the veggies to be pressed down, while the brine came further up. It also prevented flies from getting it, while allowing air to get out. This is important and might be the most difficult part to the process. Play around before starting the ferment with which container combo will work best for you. 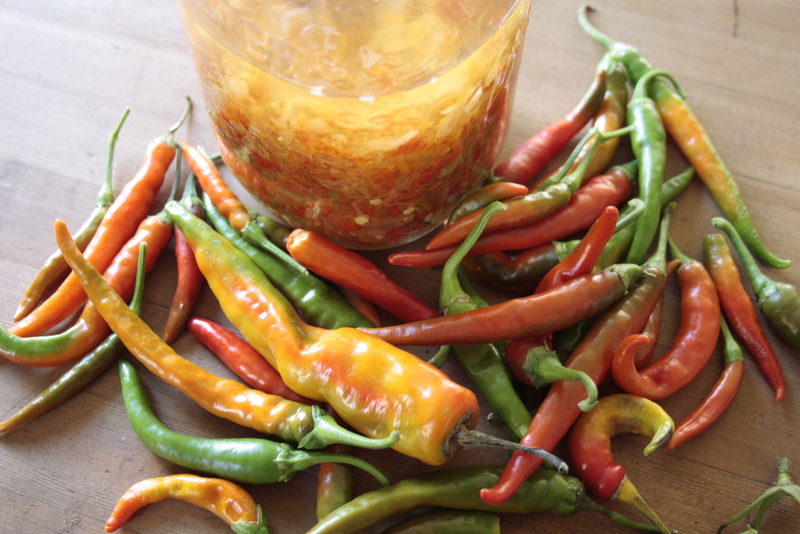 I have started wiping the glass edge and jar mouth really well with a paper napkin to ensure there is no rouge veggies which will mold along the inside of the container… since implementing this step I have had really clean and more successful ferments. Then set your ferment aside, monitor for scum, and if you see any, remove it. Allow to ferment for 1 month or more. When you are dying to dip in, pour off any excess brine and blend the mixture in a processor or vitamix until really well combined. I have read about people adding zanthan to help suspend pepper bits in sauce, but I just shake mine well before use. Now you can store it just like this in the fridge and enjoy it for a couple weeks / months, but If you want a more “red hot” taste and a longer shelf like you can add it some apple cider vinegar, which I did and really love the results! This really allows you to explore taste and texture and play with your ferments. Good luck out there!